Your UFCW Local 700 Bargaining Committee met today with representatives from the Kroger Co., and outlined our bargaining goals. We are focused on negotiating guaranteed wage increases over the life of the contract; protecting affordable, quality health care; and securing your retirement benefits for the future. The health care coverage negotiated as part of the Indianapolis Kroger contract will also apply to Kroger workers in Ft. Wayne and South Bend. Meat pensions are bargained separately in Indianapolis, Ft. Wayne, and South Bend; clerk pensions are covered by the nationally bargained UFCW Consolidated Pension Fund. The company gave our bargaining committee an overview of its business including market share. Due to the Easter holiday, our next meeting is scheduled for April 23. The contract between UFCW Local 700 and Kroger Indianapolis expires on May 12, 2019. The agreement covers more than 10,000 workers in over 70 stores in the Indianapolis area. If you’d like bargaining updates, follow us on Twitter or Facebook, or email us with subject Indy Kroger. Should you have any questions or want further information, please contact your Union Representative. Your UFCW Local 700 Union Bargaining Committee is preparing for negotiations for a new agreement with Indianapolis Kroger. On April 8, members of the Bargaining Committee will attend a training presented by our union and the Federal Mediation and Conciliation Service (FMCS), a government agency that often assists in contract negotiations and mediation. Negotiations for the Indianapolis Kroger contract are scheduled to begin on April 11.We are committed to reaching an agreement that raises wages, increases opportunity, protects affordable, quality health care benefits, and keeps members safe at work. If you’d like to receive updates throughout negotiations, please email bkelly@ufcw700.orgwith subject Indy Kroger. Should you have any questions or desire further information, please contact your Union Representative. UFCW Local 700 is pleased to announce that our Union Bargaining Committee and representatives from Chartwells reached a tentative agreement for a new contract. The current contract between UFCW Local 700 and Chartwells expires May 3, 2019.
a YES VOTE to APPROVE the proposed contract. Should you have any questions or desire further information, please contact your Union Representative, Juan Garcia at 317-752-3809 or Scott Barnett at 574-276-6526. 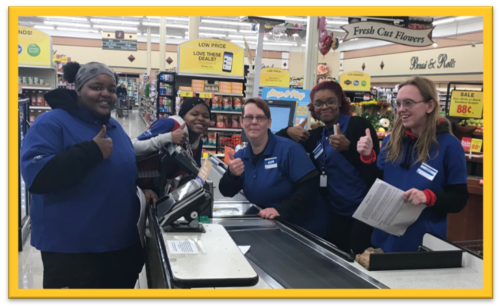 The contract between UFCW Local 700 and Kroger Indianapolis expires on May 12, 2019. The agreement covers more than 10,000 workers in over 100 stores in the Indianapolis area. Your UFCW Local 700 Union Bargaining Committee will be comprised of Union leaders and representatives, and 15 members who work in Indianapolis Kroger stores, as well as UFCW International staff. Thanks for the many contract proposals we received from members. We are committed to reaching an agreement that raises wages, increases opportunity, protects affordable, quality health care benefits, and keeps members safe at work. During bargaining, we will be negotiating wages, language, and the meat pension, plus health care coverage for Kroger workers in Indianapolis, Ft. Wayne, and South Bend. We have scheduled a number of dates in April and May leading up to the contract expiration. If you’d like to receive updates throughout negotiations, please email with subject Indy Kroger or check us out on Facebook or Twitter. The contract between UFCW Local 700 and Chartwells expires May 3, 2019. We are committed to reaching an agreement that raises pay, increases opportunity, and keeps members safe at work. In our first contract, we stuck together and were able to win workplace improvements that help Chartwells workers and your families to have a better life. For the second contract, we’ve made a lot of good progress on language and non-economic items in the past two days of negotiations. We are scheduled to meet again the first week of March, when we will address issues like pay rates and health care benefits. Your Union Bargaining Committee is working hard to reach a strong agreement during our next meetings. If you’d like to receive bargaining updates, please email bkelly@ufcw700.org with subject Chartwells Update, or follow us on Facebook or Twitter (@UFCW700). Should you have any questions or desire further information, please contact your Union Representative, Juan Garcia at 317-752-3809. United Food and Commercial Workers Union (UFCW) Local 700 announced the endorsement for Mayor John Hamilton’s re-election today. UFCW Local 700 represents nearly 14,000 workers in supermarkets and food packing, processing, and manufacturing plants and is part of the 1.3 million member United Food and Commercial Workers International Union. Mayor John Hamilton is the 26th mayor of Bloomington. During his time in office, Mayor Hamilton has dedicated himself to increasing the number of good jobs in Bloomington, promoting sustainability, increasing affordable housing, supporting public education, and making a high quality of life available to all our residents. Under Mayor Hamilton, Bloomington proudly became the first Community Development Financial Institution (CDFI) Friendly City, bringing in new investment for minority-owned businesses, community facilities, and affordable housing. Mayor Hamilton announced his candidacy for re-election in December of 2018. UFCW Local 700 proudly awards $22,000 per year in scholarships to members and your dependents. UFCW Local 700 is proud to award $22,000 per year in scholarships to members or dependents. Applicants must be UFCW Local 700 members in good standing, or their legal dependents; have graduated or will graduate from high school or are currently enrolled in college or trade school; must have completed the SAT or ACT; and must be accepted to an accredited institution OR met the requirements and enrolled in a two-year community college, technical, or trade school. Twice a year, we award $11,000 in scholarships: Five at $1,000 each and twelve at $500 each. Click here for details on scholarship program. Applications must be postmarked no later than December 10, 2018. DEADLINE EXTENDED to December 28, 2018. 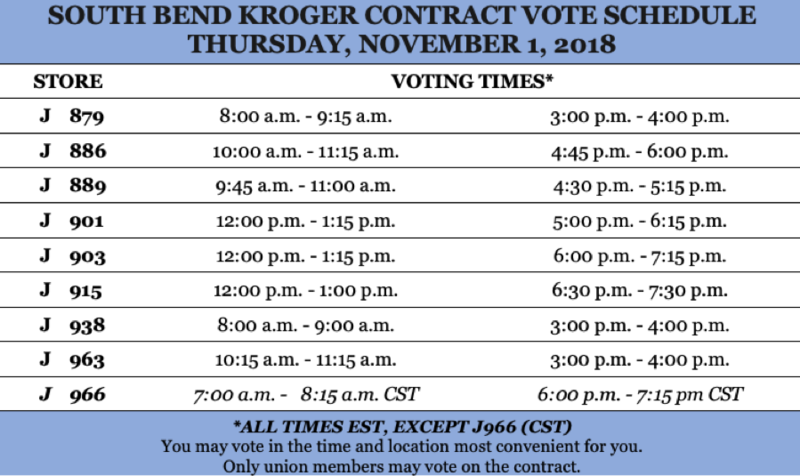 Your Union Bargaining Committee is proud to announce that members have voted to approve a new contract with Kroger for a new one-year contract covering about 800 workers in nine stores in the South Bend area. The new contract helps create a more secure future for Kroger workers and your families through regular, guaranteed wage increases; investment in securing your pension; protection of quality, affordable health care; and contract language improvements. The contract is effective upon approval; wage rates are effective November 11, 2018. Should you have any questions, please contact your Union Representative. Your Union Bargaining Committee is proud to announce that we’ve reached a tentative agreement with Kroger for a new one-year contract covering South Bend stores. THE UNION OFFICERS, STAFF, AND UNION BARGAINING COMMITTEE RECOMMEND A YES VOTE TO APPROVE THE PROPOSED CONTRACT. The proposed agreement helps create a more secure future for Kroger workers and our families through regular, guaranteed wage increases; protection of affordable, quality health care; investment in securing your pension; and contract language improvements. Union Representatives and Bargaining Committee Members will be in stores on Tuesday, October 30, and Wednesday, October 31, to discuss details of the proposed contract and answer questions. Voting will take place on Thursday, November 1; locations and times are listed below.